Today’s XMission Zimbra power tip identifies how to text yourself when an important email arrives. It uses a simple Zimbra filter and only takes about five seconds to setup. 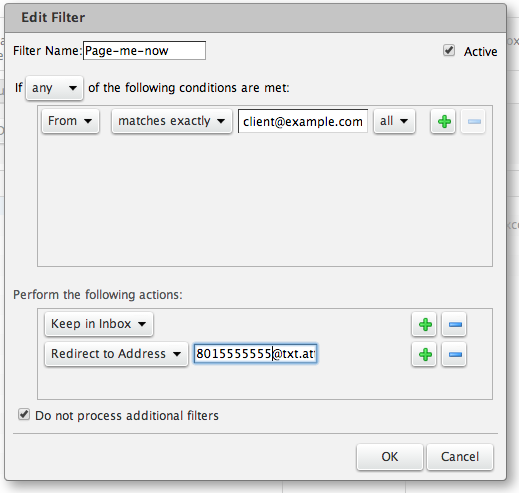 Configure an email filter to page you when important emails arrive. Click to see larger graphic. In this example we will keep a copy in the Inbox as well as send a copy to the email to text message gateway of your mobile service provider. Inside the “Perform the following actions:” area [Keep in Inbox] will be set by default. We want to leave that and then add one more rule by clicking on the green “+” button. Select [Redirect to Address] and enter your mobile provider’s email to text message gateway address or an email alias you have setup for texting your phone. Verify the “[ x ] Do not process additional filters” box is checked. Now [Save] your new filter. From here forward you should receive texts to your phone. If you want, have the important address send you a test email to make sure it performs as expected. Some content of the email message will likely appear in the texts. It will continue to text you every time email arrives from the specified address as long as the filter exists. Highlight the filter and click the “Remove” button in Filters preferences to de-activate and save for later use. If your phone plan charges for text messages you may have to pay. Some email to text gateways experience congestion and notifications could take awhile to reach your phone. To quickly setup the filter click on the important email address in your reading pane, right mouse click, and select Add to Filter / New Filter. I hope this quick and easy tip helped you. Follow, like, circle, and join us on the social links below.